Former FBI director James Comey publicly defended James Baker, a top lawyer at the FBI who was recently reassigned to a different role under FBI director Christopher Wray. It was the first time Comey weighed in on the FBI’s activities since his testimony before the Senate Intelligence Committee in June, one month after he was fired. Though it’s normal practice for a new FBI director to bring in their own general counsel, some observers questioned the timing of Baker’s reassignment, which comes as Republicans are pressuring the bureau to get rid of officials perceived as biased against President Donald Trump. 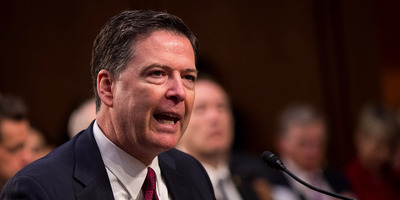 Former FBI director James Comey issued a rare statement of a political nature on Friday night, following reports that FBI general counsel James Baker had been reassigned within the bureau. Since making his Twitter presence publicly known in recent months, Comey has been coy with his political statements, tweeting out quotes about justice and the rule of law, typically after developments in the Russia investigation or after President Donald Trump attacks the FBI and the free press. His tweet on Friday defending Baker was the first time Comey directly weighed in on the FBI’s activities since his testimony before the Senate Intelligence Committee in June, one month after Trump fired him. The Washington Post first reported on FBI director Christopher Wray’s decision to move Baker, and Politico reported afterward, citing House Republican sources, that Baker was in contact with Mother Jones reporter David Corn leading up to the 2016 election. Corn first reported on the existence of the bombshell Steele dossier, which alleges several ties between Trump and Russian entities, in late October 2016. Former US attorney Joyce Vance told MSNBC on Friday that there are any number of reasons why the FBI’s top lawyer would be in touch with a reporter. House Republicans are now investigating Baker’s contacts with Corn. In addition to Comey, Politico’s report drew scrutiny from others who criticised the outlet for citing congressional GOP sources who could not confirm that Baker had passed Corn information about the dossier. Susan Hennessey, the former general counsel at the National Security Agency, accused Politico of running an “utterly transparent smear” against Baker “without offering even the smallest context or pushback.” And Lawfare editor-in-chief Benjamin Wittes, who writes mainly about national security and is a close friend of Comey’s, said on Twitter that it was “irresponsible” for Politico to publish unverified claims about Baker despite Corn’s denial that Baker was his source. It is normal practice for a new FBI director to bring in his own general counsel, as Comey did with Baker, Vance told MSNBC. But the timing of Baker’s reassignment was questioned by some who wondered whether the move was Wray’s response to Republican pressure to rid the bureau’s ranks of officials perceived as partisan or biased against Trump. Baker was one of three FBI officials that Comey told about his conversations with Trump, during which Trump asked him for his loyalty and to let go of the bureau’s ongoing investigation into former national security adviser Michael Flynn. Flynn pleaded guilty earlier this month to one count of making false statements to federal agents about his contacts with Sergei Kislyak, Russia’s former ambassador to the US. Trump’s conversations with Comey about Flynn are at the center of the obstruction-of-justice investigation that special counsel Robert Mueller is overseeing as part of the Russia probe. In addition to Baker, Comey also apprised his chief of staff and senior counselor James Rybicki, and deputy FBI director Andrew McCabe of his conversations with Trump. All three have since been targeted or investigated by Trump’s Republican allies in the media and in Congress.